It’s been a while since I posted, so I thought I’d check in and say that we’re still hitting it hard. We’ve tried lots of new places this season, and revisited some old ones, with mixed results. Last week I hunted four days in a row for the first time ever. Angus had to sit out two of those, but he distinguished himself on his two hunts, one of which far exceeded the most climbing we’ve ever done. The briefest of those four, probably my last after-school hunt of the season, was perhaps the most interesting, with Peat pointing four times in the first 20 minutes, and me ending up with a ruffed grouse, two Huns, and a huge 4-point mule deer shed in classic chukar country. 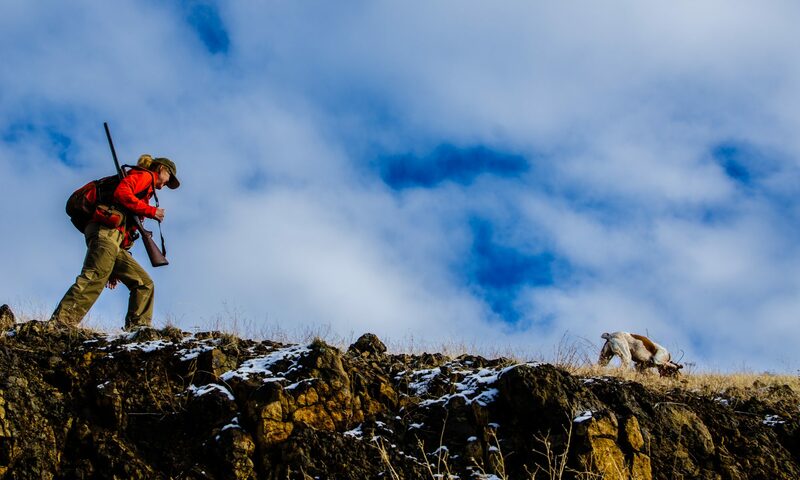 My brother, who recently enjoyed an epic dog-less chukar experience on the Main Salmon, visited for a couple hunts — one of which (the heavy climbing one) featured lots of birds sighted but few bagged, and the other in some spectacular country apparently barren of birds. We had a sad encounter with a bird hunter who flagged us down to tell us to be on the lookout for his 13-year-old GSP, “Gopher,” who he’d lost the previous evening and presumed was dead. Makes you think. Yesterday, after a nasty head cold week, and still not feeling well, I went out with the two dogs for an easy walk with the gun, mainly to alleviate Peat’s stircraziness. I have no idea why, but it turned into my longest hike of the year (8.25 miles), with way more climbing than I would have liked. I fired once and missed a single pointed chukar, and saw two small-ish coveys that busted wild. Old Warrior Angus ran 20 miles, eclipsing Peat on this hunt by 2 miles, which is weird; it’s been the opposite all season, but might be because Peat has a little cut in one of his pads. And the weather has changed. We’re not sure what the balance of the season holds. I’m hoping we get more of a season than last year, when we were done by mid-December because of the weather. Word in the valley is that this winter will look a little heavier than last year. I’m betting we’ll make at least one more trip to lower elevations to look for more populous habitat. Leslie’s still in search of her first chukar. And she’s still eager. Stay tuned. Lovely pics. Look forward to one with Leslie holding up her first chukar. Keep the pictures and stories coming. They’re great. Good for Angus and showing what the old timers can do. Thanks, Robb. Nope, that wasn’t me on the Salmon. How was your hunt? It was pretty good. Public access from the road is somewhat limited. I closed down Pure Quill, but I still enjoy reading your blog. Keep at it, and thanks for letting us tag along. Thanks, Weldon. Not sure I get your first sentence… (really).